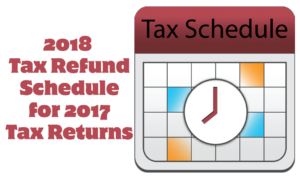 The IRS does not currently release a 2018 Tax Schedule, so we created our own based on prior year(s) tax refund dates. 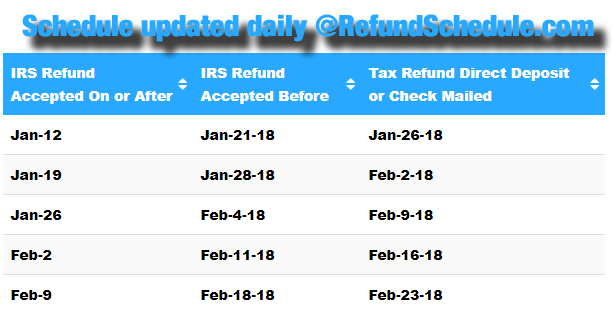 This list is purely for estimating your tax refund date and every tax return is different so yours could take much longer or shorter depending on your situation. This is our best answer to the question, “Where’s my Refund?” This is our Federal Income Tax Schedule for 2018. Hopefully not. We currently have no evidence of a tax delay for 2018. We will update this page as soon as we know anything. Are there any consumer rebate programs going on currently? Yes, but there is very tough qualifications. Find out how you can here. *DISCLAIMER: This is only an estimate of when your tax refund will be in. The IRS doesn’t have anything to do with the creation and distribution of this 2018 Tax Schedule. The only official word from the IRS is 30 days after acceptance. Please do not use this schedule as anything more than general information due to prior year(s) dates.